, a learned English divine, a great champion of Arianism, and memorable for his sufferings on that account, was descended of a substantial and reputable family, and born at Stamford, in Lincolnshire, May 27, 1663. His parents were frequenters of the established church, and particularly acquainted with Cumberland, then a minister at Stamford, afterwards bishop of Peterborough; but being inclined to the sentiments of the nonconformists, they chose to bring up their son to the ministry among them. For this purpose, after he had been at a private school four years, he was sent in 1678 to an, academy in Northamptonshire, where he continued four years more. He went in 1679 to Cambridge, and was admitted of Emanuel college; but soon returned to the academy. In August 1682, he removed to Mr. Doolittle’s school near London; and in December following made his first essay as a preacher at Mr. Doolittle’s meeting-house, near Cripplegate. 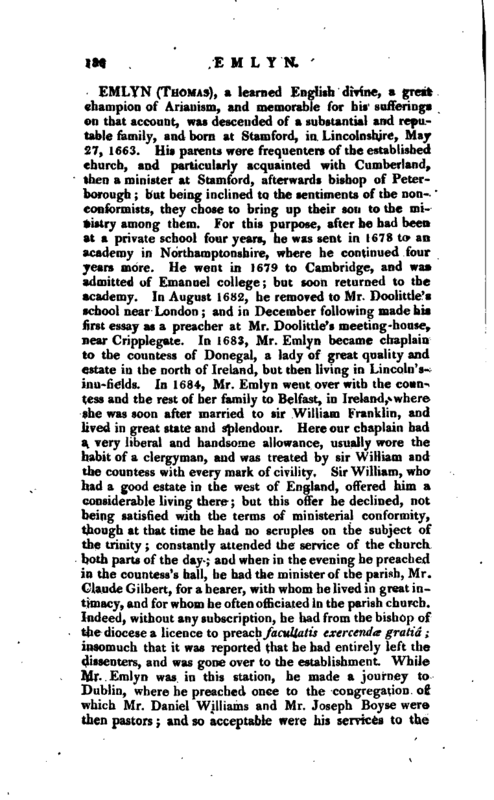 In 1683, Mr. Emlyn became chaplain to the countess of Donegal, a lady of great quality and estate in the north of Ireland, but then living in Lincoln’sinn-fields. In 1684, Mr. Emlyn went over with the countess and the rest of her family to Belfast, in Ireland, where she was soon after married to sir William Kranklin, and lived in great state and splendour. Here our chaplain had a very liberal and handsome allowance, usually wore the habit of a clergyman, and was treated by sir VV illiam and the countess with every mark of civility. Sir William, who had a good estate in the ivest of England, offered him a considerable living there; but this offer he declined, not being satisfied with the terms of ministerial conformity, though at that time he had no scruples on the subject of the trinity constantly attended the service of the church both parts of the day and when in the evening he preached in the countess’s hall, he had the minister of the parish, Mr. Claude Gilbert, for a hearer, with whom he lived in great intimacy, and for whom he often officiated in the parish church. Indeed, without any subscription, he had from the bishop of the diocese a licence to preach facultatis exercende gratiá; insomuch that it was reported that he had entirely left the dissenters, and was gone over to the establishment. 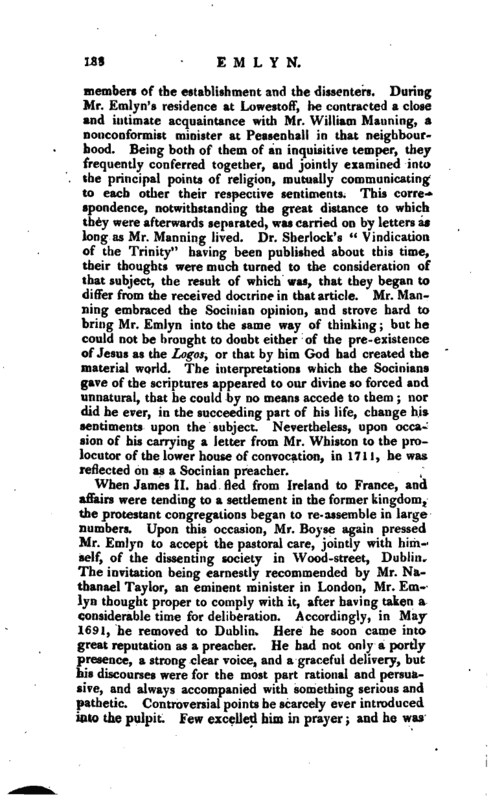 While Mr. Emlyn was in this station, he made a journey fo Dublin, where he preached once to the congregation of which Mr. Daniel Williams and Mr. Joseph Boyse were then pastors; and so acceptable were his services to the | audience, that the people were afterwards induced to invite him thither. Towards the latter end of king James’s reign, the north of Ireland was thrown into such confusion and disorder, that the family of sir William Franklin and the countess of Donegal broke up; an event which was accelerated by some domestic differences. Mr. Emlyn, therefore, returned to London, where he arrived in December 1688. 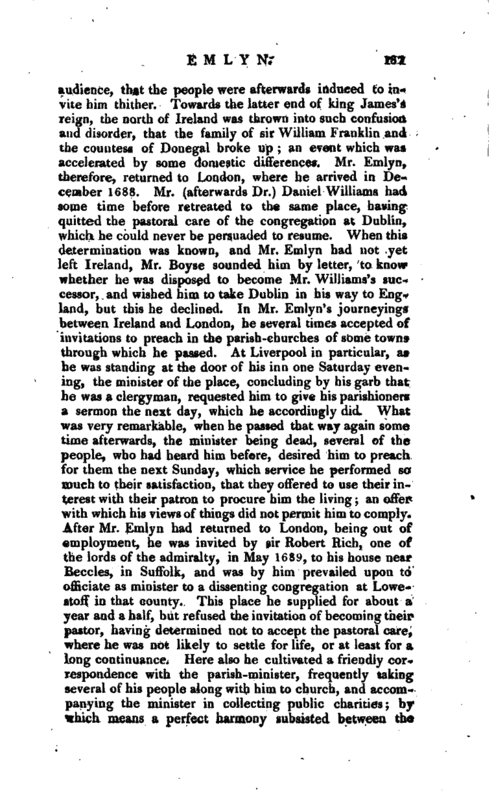 Mr. (afterwards Dr.) Daniel Williams had some time before retreated to the same place, having quitted the pastoral care of the congregation at Dublin, which he could never be persuaded to resume. When this determination was known, and Mr. Emlyn had not yet left Ireland, Mr. Boyse sounded him by letter, to know whether he was disposed to become Mr. Williams’s successor, and wished him to take Dublin in his way to England, but this he declined. In Mr. Emlyn’s journeyings between Ireland and London, he several times accepted of invitations to preach in the parish-churches of some towns through which he passed. At Liverpbol in particular, as he was standing at the door of his inn one Saturday evening, the minister of the place, concluding by his garb that he was a clergyman, requested him to give his parishioners a sermon the next day, which he accordingly did. What was very remarkable, when he passed that way again some time afterwards, the minister being dead, several of the people, who had heard him before, desired him to preach for them the next Sunday, which service he performed so much to their satisfaction, that they offered to use their interest with their patron to procure him the living; an offer with which his views of things did not permit him to comply. After Mr. Emlyn had returned to London, being out of employment, he was invited by sir Robert Rich, one of the lords of the admiralty, in May 1689, to his house near Beccles, in Suffolk, and was by him prevailed upon to officiate as minister to a dissenting congregation at Lowestoff in that county. This place he supplied for about a year and a half, but refused the invitation of becoming their pastor, having determined not to accept the pastoral care, where he was not likely to settle for life, or at least for a long continuance. Here also Vie cultivated a friendly correspondence with the parish-minister, frequently taking several of his people along with him to church, and accompanying the minister in collecting public charities; by which means a perfect harmony subsisted between the | members of the establishment and the dissenters. During Mr. Emlyn’s residence at LowestofT, ho contractcJ a closu and intimate acquaintance with Mr. William Manning, a nonconformist minister at Peasenhall in that neighbourhood. Being both of them of an inquisitive temper, they frequently conferred together, and jointly examined into the principal points of religion, mutually communicating to each other their respective sentiments. This correspondence, notwithstanding the great distance to which they were afterwards separated, was carried on by letters as long as Mr. Manning lived. 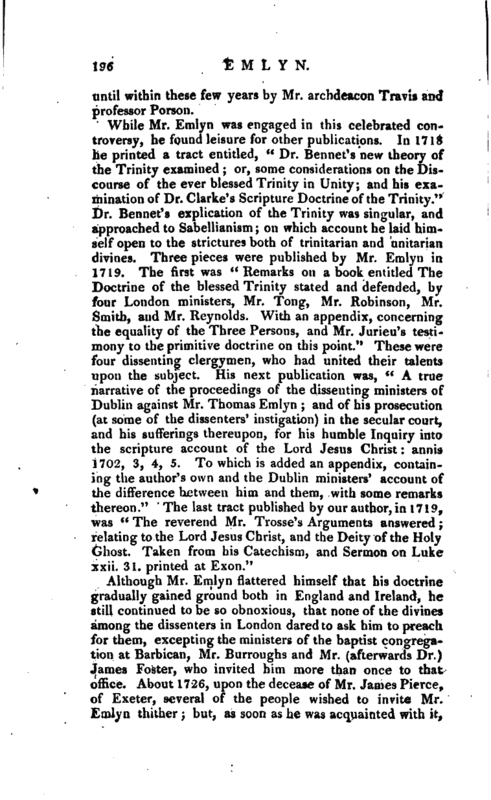 Dr. Sherlock’s “Vindication of the Trinity” having been published about this time, their thoughts were much turned to the consideration of that subject, the result of which was, that they began to differ from the received doctrine in that article. Mr. Manning embraced the Socinian opinion, and strove hard to bring Mr. Emlyn into the same way of thinking; but he could not be brought to doubt either of the pre-existence of Jesus as the Logos, or that by him God had created the material world. The interpretations which the Socinians gave of the scriptures appeared to our divine so forced and unnatural, that he could by no means accede to them; nor did he ever, in the succeeding part of his life, change his sentiments upon the subject. Nevertheless, upon occasion of his carrying a letter from Mr. Whiston to the prolocutor of the lower house of convocation, in 1711, he was reflected on as a Socinian preacher. When James II. bad fled from Ireland to France, and affairs were tending to a settlement in the former kingdom, the protestant congregations began to re-assemble in large numbers. Upon this occasion, Mr. Boyse again pressed Mr. Emlyn to accept the pastoral care, jointly with himself, of the dissenting society in Wood-street, Dublin. The invitation being earnestly recommc’nded by Mr. Nathanael Taylor, an eminent minister in London, Mr. Emlyn thought proper to comply with it, after having taken a considerable time for deliberation. Accordingly, in May 1691, he removed to Dublin. Here he soon came into great reputation as a preacher. He had not only a portly presence, a strong clear voice, and a graceful delivery, but his discourses were for the most part rational and persuasive, and always accompanied with something serious and pathetic. Controversial points he scarcely ever introduced into the pulpit. Few excelled him in prayer; and he was | exemplary in the private duties which were incumbent upon him as a Christian minister. 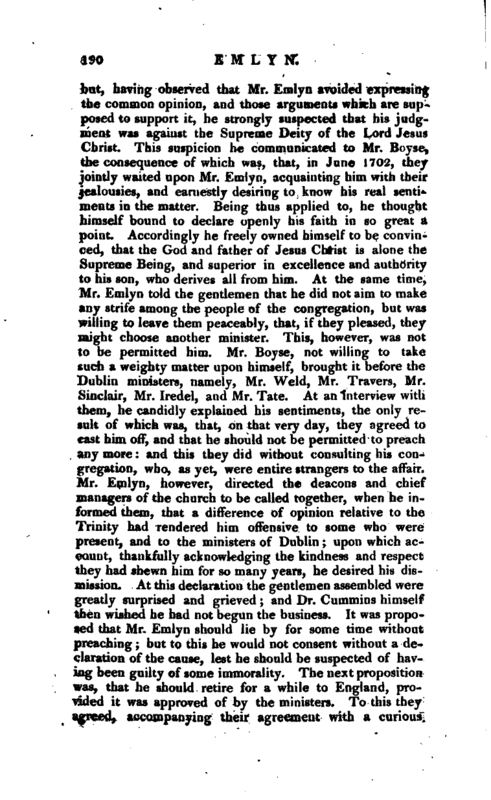 Mr. Emlyn being thus settled in Dublin, contracted an acquaintance there with Mrs. Esther Bury, who, though an usual attendant on the church-service, had been induced, by the fame of his preaching, to become his hearer. 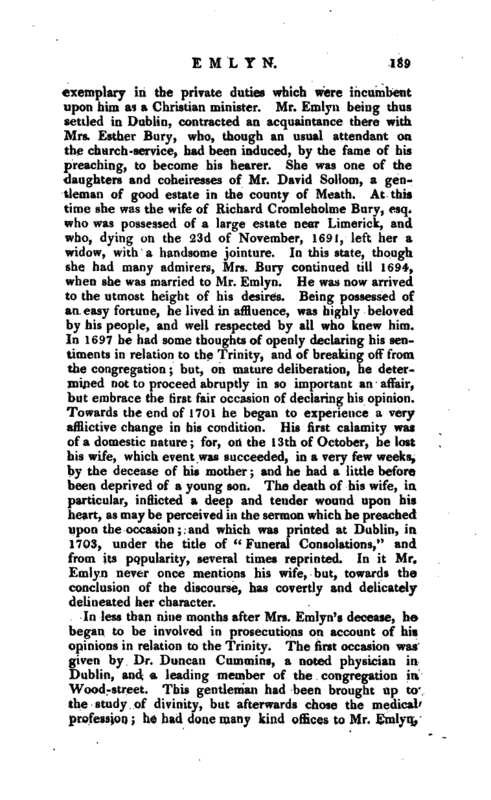 She was one of the daughters and coheiresses of Mr. David Sollom, a gentleman of good estate in the county of Meath. At this time she was the wife of Richard Cromleholme Bury, esq. who was possessed of a large estate near Limerick, and who, dying on the 23d of November, 1691, left her a widow, with a handsome jointure. In this state, though she had many admirers, Mrs. Bury continued till 1694, when she was married to Mr. Emlyn. He was now arrived to the utmost height of his desires. Being possessed of an easy fortune, he lived in affluence, was highly beloved by his people, and well respected by all who knew him. In 1697 he had some thoughts of openly declaring his sentiments in relation to the Trinity, and of breaking off from the congregation; but, on mature deliberation, he determined not to proceed abruptly in so important an affair, but embrace the first fair occasion of declaring his opinion. Towards the end of 1701 he began to experience a very afflictive change in his condition. His first calamity was of a domestic nature; for, on the 13th of October, he lost his wife, which event was succeeded, in a very few weeks, by the decease of his mother; and he had a little before been deprived of a young son. The death of his wife, in. particular, inflicted a deep and tender wound upon his heart, as may be perceived in the sermon which he preached upon the occasion; and which was printed at Dublin, in 1703, under the title of “Funeral Consolations,” and from its popularity, several times reprinted. In it Mr. Emlyn never once mentions his wife, but, towards the conclusion of the discourse, has covertly and delicately delineated her character. In less than nine months after Mrs. Emlyn’s decease, he began to be involved in prosecutions on account of his opinions in relation to the Trinity. The first occasion was given by Dr. Duncan Cummins, a noted physician in Ihibiin, and a leading member of the congregation in Wood-street. This gentleman had been brought up to the study of divinity, but afterwards chose the medical profession; he had done many kind offices to Mr. Emlyn, | but, having observed that Mr. Emlyn avoided expressing the common opinion, and those arguments which are supposed to support it, he strongly suspected that his judgment was against the Supreme Deity of the Lord Jesus Christ. This suspicion he communicated to Mr. Boyse, the consequence of which was, that, in June 1702, they jointly waited upon Mr. Emlyn, acquainting him with their jealousies, and earnestly desiring to know his real sentiments in the matter. Being tlius applied to, he thought himself bound to declare openly his faith in so great a point. Accordiugly he freely owned himself to be convinced, that the God and father of Jesus Christ is alone the Supreme Being, and superior in excellence and authority to his son, who derives all from him. At the same time, Mr. Emlyn told the gentlemen that he did not aim to make any strife among the people of the congregation, but was willing to leave them peaceably, that, if they pleased, they might choose another minister. This, however, was not to be permitted him. Mr. Boyse, not willing to take such a weighty matter upon himself, brought it before the Dublin ministers, namely, Mr. Weld, Mr. Travers, Mr. Sinclair, Mr. Iredel, and Mr. Tate. At an interview with them, he candidly explained his sentiments, the only resuli of which was, that, on that very day, they agreed to cast him off, and that he should not be permitted to preach any more: and this they did without consulting his congregation, who, as yet, were entire strangers to the affair. Mr. Emlyn, however, directed the deacons and chief managers of the church to be called together, when he informed them, that a difference of opinion relative to the Trinity had rendered him offensive to some who were present, and to the ministers of Dublin; upon which account, thankfully acknowledging the kindness and respect they had shewn him for so many years, he desired his dismission. At this declaration the gentlemen assembled were greatly surprised and grieved; and Dr. Cummins himself then wished he had not begun the business. It was proposed that Mr. Emlyn should lie by for some time without preaching; but to this he would not consent without a declaration of the cause, lest he should be suspected of having been guilty of some immorality. The next proposition, was, that he should retire for a while to England, provided it was approved of by the ministers. To this they agreed, accompanying their agreement with a curious | message, sent by two of their number, charging him not to preach any where, to whatever place he went. Mr. Emlyn embarked for England the next day, with great inconvenience to himself and family; and, no sooner was he gone, than a loud clamour was raised against him and his opinions. When he came to London, he found some persons who were disposed to treat him with candour and charity. This, however, when they heard of it, was so offensive to the Dublin ministers, that they endeavoured, by their letters, to render him as odious as possible. While he was in London, he published a short account of his case. After about ten weeks’ absence, though Mr. Emlyn received discouraging accounts of the rage that prevailed against him in Dublin, he thought it necessary to return, to his family. Finding that both his opinions and his person lay under a great odium among many who knew little of the subject in dispute, he wrote his “Humble Inquiry into the Scripture account of Jesus Christ: or, a short argument concerning his Deity and Glory, according to the Gospel.” A few days after this work was prinjted, our author intended to return to England; but some zealous dissenters, getting notice of his design, resolved to have him prosecuted. Two of them, one of whom was a presbyterian, and the other a baptist-church officer, were for presenting Mr. Emlyn; but, upon reflection, this method was judged to be too slow, and too uncertain in its operation. Mr. Caleb Thomas, therefore, the latter of the two dissenters, immediately obtained a special warrant from the lord chief justice (sir Richard Pyne) to seize our author and his books. 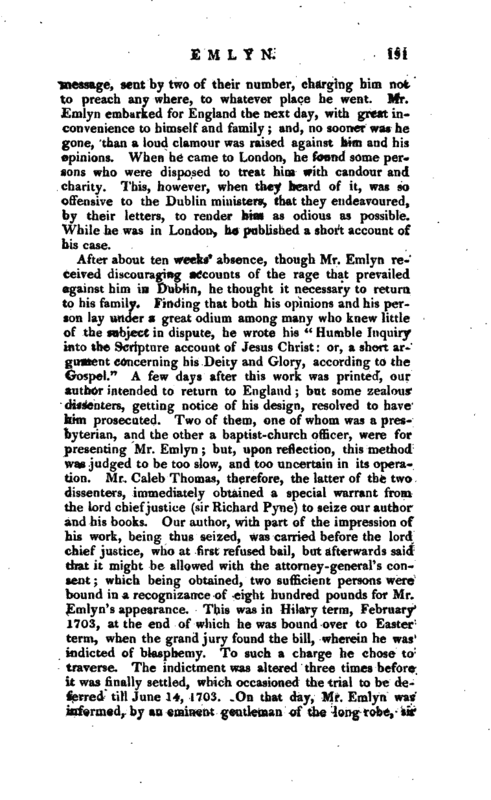 Our author, with part of the impression of his work, being thus seized, was carried before the lord chief justice, who at first refused bail, but afterwards said that it might be allowed with the attorney-general’s consent; which being obtained, two sufficient persons were bound in a recognizance of eight hundred pounds for Mr. Emlyn’s appearance. This was in Hilary term, February 1703, at the end of which he was bound over to Easter term, when the grand jury found the bill, wherein he was indicted of blasphemy. To such a charge he chose to traverse. The indictment was altered three times before it was finally settled, which occasioned the trial to be deferred till June 14, 1703. On that day, Mr. Emlyn was informed, by an eminent gentleman of the long robe, sir | Richard Levins, afterwards lord chief justice of the common pleas, that he would not be permitted to speak freely, but that it was designed to run him down like a wolf, without law or game; and he was soon convinced that this was not a groundless assertion. The indictment was for writing and publishing a book, wherein he had blasphemously and maliciously asserted, that Jesus Christ was not equal to God the father, to whom he was subject; and this with a seditious intention. As Mr. Emlyn knew that it would be difficult to convict him of being the author of the work, he did not think himself bound to be his own accuser, and the prosecutor not being able to produce sufficient evidence of the fact, at length sent for Mr. Boyse. This gentleman, being examined as to what Mr. K.mlyn had preached of the matters contained in the book, acknowledged that he had said nothing of tlu-tn in the pulpit directly, but only some things that gave ground of suspicion. 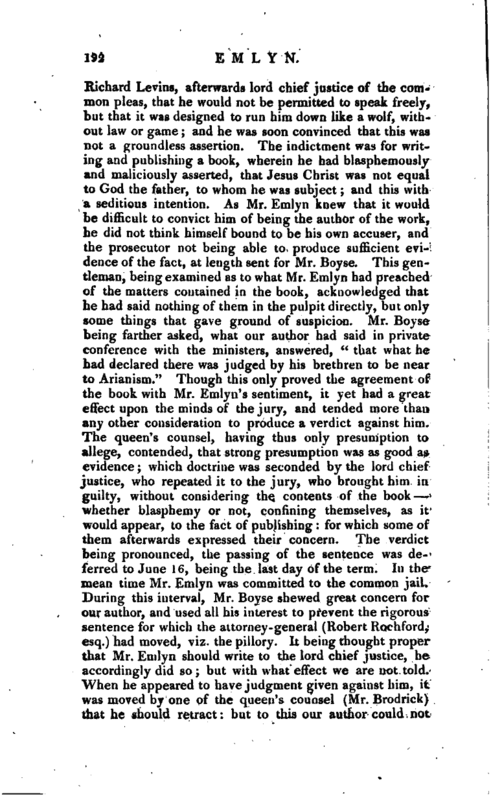 Mr. Boyse being farther asked, what our author had said in private conference with the ministers, answered, “that what he had declared there was judged by his brethren to be near to Arianism.” Though this only proved the agreement of the book with Mr. Emlyn’s sentiment, it yet had a great effect upon the minds of the jury, and tended more than any other consideration to produce a verdict against him. The queen’s counsel, having thus only presumption to allege, contended,that strong presumption was as good as evidence; which doctrine was seconded by the lord chief justice, who repeated it to the jury, who brought him in guilty, without considering the contents of the book whether blasphemy or not, confining themselves, as it would appear, to the fact of publishing: for which some of them afterwards expressed their concern. The verdict being pronounced, the passing of the sentence was deferred to June 16, being the last day of the term. In the mean time Mr. Emlyn was committed to the common jail. During this interval, Mr. Boyse shewed great concern for our author, and used all his interest to prevent the rigorous sentence for which the attorney-general (Robert Kochford, esq.) had moved, viz. the pillory. It being thought proper that Mr. Emlyn should write to the lord chief justice, he accordingly did so; but with what effect we are not told. When he appeared to have judgment given against him, it was moved by one of the queen’s counsel (Mr. Brodrick) that he should retract: but to this our author could not | consent. The lord chief justice, therefore, proceeded to pass sentence on him; which was, that he should suffer a year’s imprisonment, pay a thousand pounds fine to the queen, and lie in prison till paid; and that he should find security for good behaviour during life. The pillory, he was told, was the punishment due; but, on account of his being a man of letters, it was not inflicted. Then, with a paper on his breast, he was led round the four courts to l>e exposed. After judgment had been passed, Mr. Emlyn was committed to the sheriffs of Dublin, and was a close prisoner, for something more than a quarter of a year, in the house of the under-sheriff. On the 6th of October he was hastily hurried away to the common jail, where he lay among the prisoners in a close room filled with six beds, for about five or six weeks; and then, by an habeas corpus, he was upon his petition removed into the Marshalsea for his health. Having here greater conveniences, he wrote, in 1704, a tract, entitled “General Remarks on Mr. Boyse’s Vindication of the true Deity of our blessed Saviour.” In the Marshalsea our author remained till July 21, 1705, during the whole of which time his former acquaintances were estranged from him, and all offices of friendship or.civility in a manner ceased; especially among persons of a superior rank. A few, indeed, of the plainer tradesmen belonging to his late congregation were more compassionate; but not one of the dissenting ministers of Dublin, Mr. Boyse excepted, paid him any visit or attention. At length, through the zealous and repeated solicitations of Mr. Boyse, the generous interference of Thomas Medlicote, esq. the humane interposition of the duke of Ormond, and the favourable report of the lord chancellor (sir Richard Cox, to whom a petition of Mr. Emlyn had been preferred), and whose report was, that such exorbitant fines were against law, the fine was reduced to seventy pounds, and it was accordingly paid into her majesty’s exchequer. Twenty pounds more were paid, by way of composition, to Dr. Narcissus March, archbishop of Armagh, who, as queen’s almoner, had a claim of one shilling a pound upon the whole fine. During Mr. Emlyn’s confinement in the Marshalsea, he regularly preached there. He had hired a pretty large room to himself; whither, on the Sundays, some of the imprisoned debtors resorted; and from without doors there came several of the lower sort of his former people and usual hearers. | Soon after his release Mr. Emlyn returned to London, where a small congregation was found for him, consisting of a few friends, to whom he preached once every Sunday. This he did without salary or stipend; although, in consequence of his wife’s jointure having devolved to her children, his fortune was reduced to a narrow income. 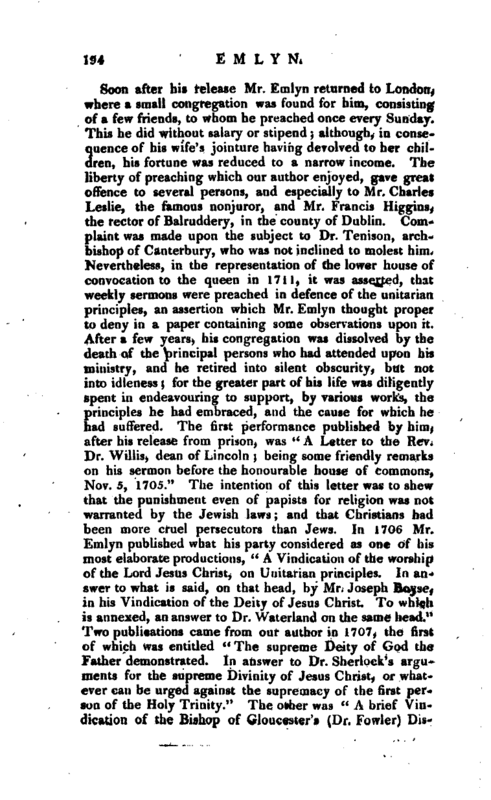 The liberty of preaching which our author enjoyed, gave great offence to several persons, and especially to Mr. Charles Leslie, the famous nonjuror, and Mr. Francis Higgins, the rector of Balruddery, in the county of Dublin. Complaint was made upon the subject to Dr. Teniaon, archbishop of Canterbury, who was not inclined to molest him. Nevertheless, in the representation of the lower house of convocation to the queen in 1711, it was asserted, that weekly sermons were preached in defence of the Unitarian principles, an assertion which Mr. Emlyn thought proper to deny in a paper containing some observations upon it. After a few years, his congregation was dissolved by the death of the principal persons who had attended upon his ministry, and he retired into silent obscurity, but not into idleness; for the greater part of his life was diligently spent in endeavouring to support, by various works, the principles he had embraced, and the cause for which he had suffered. The first performance published by him, after his release from prison, was “A Letter to the Rev. Dr. Willis, 'dean of Lincoln; being some friendly remarks on his sermon before the honourable house of commons, Nov. 5, 1705.” The intention of this letter was to shew that the punishment even of papists for religion was not warranted by the Jewish laws; and that Christians had been more cruel persecutors than Jews. In 1706 Mr. Emlyn published what his party considered as one of his most elaborate productions, “A Vindication of the worship of the Lord Jesus Christ, on Unitarian principles. In anMver to what is said, on that head, by Mr. Joseph Boyse, in his Vindication of” the Deity of Jesus Christ. To which is annexed, an answer to Dr. Walerland on the same head.“Two publications came from our author in 1707, the first of which was entitled” The supreme Deity of God the Father demonstrated. In answer to Dr. Sherlock’s arguments fur the supreme Divinity of Jesus Christ, or whatever can be urged against the supremacy of the first person of the Holy Trinity.“The other was” A brief Vindication of the Bishop of Gloucester’s (Dr. Fowler) | Discourses concerning the descent of the man Christ Jesus from Heaven, from Dr. Sherlock the dean of St. Paul’s charge of heresy. With a confutation of his new notion in his late book of The Scripture proofs of our Saviour’s divinity.“In 1708 Mr. Emlyn printed three tracts, all of them directed against Mr. Leslie. The titles of them are as follow: 1. Remarks on Mr. Charles Leslie’s first Dialogue on the Socinian controversy. 2. A Vindication of the Remarks on Mr. Charles Leslie’s first Dialogue on the Socinian controversy. 3. An Examination of Mr. Leslie’s last Dialogue relating to the satisfaction of Jesus Christ. Together with some remarks on Dr. Stillingfleet’s True reasons of Christ’s Sufferings. In the year 1710 he published” The previous question to the several questions about valid and invalid Baptism, Lay-baptism, &c. considered viz. whether there be any necessity (upon the principles of Mr. Wall’s History of infant baptism) for the continual use of baptism among the posterity of baptised Christians.“But this hypothesis, though supported with ingenuity and learning, has not obtained many converts. Our author did not again appear from the press till 1715, when he published” A full Inquiry into the original authority of that text, 1 John v. 7. 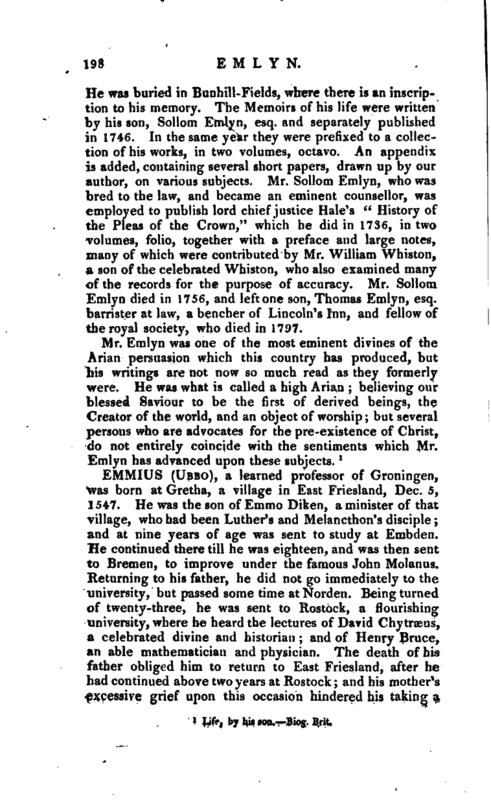 There are three that bear record in heaven, &c. containing an account of Dr. Mill’s evidence, from antiquity, for and against its being genuine; with an examination of his judgment thereupon.“This piece was addressed to Dr. William Wake, lord archbishop of Canterbury, president, to the bishops of the same province, his grace’s suffragans, and to the clergy of the lower house of convocation, then assembled. The disputed text found an advocate in Mr. Martin, pastor of the French church at the Hague, who published a critical dissertation on the subject, in opposition to Mr. Emlyn’s Inquiry. In 1718 our author again considered the question, in” An Answer to Mr. Martin’s critical dissertation on 1 John v. 7; shewing the insufficiency of his proofs, and the errors of his suppositions, by which he attempts to establish the authority of that text from supposed manuscripts." 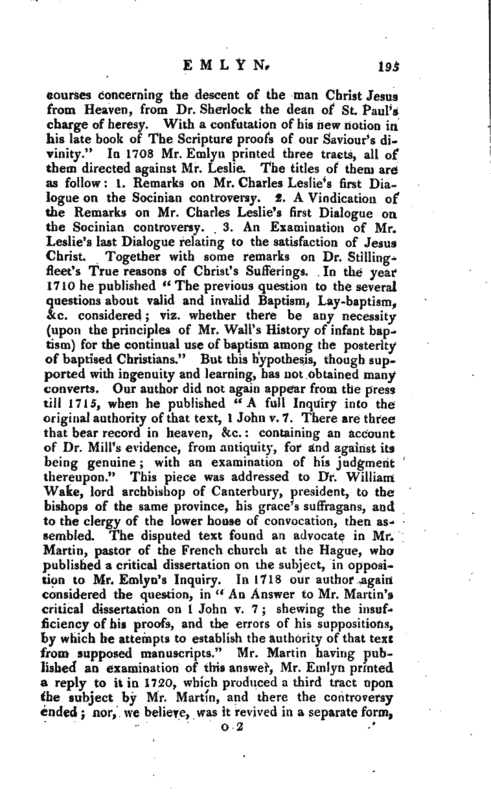 Mr. Martin having published an examination of this answer, Mr. Emlyn printed a reply to it in 1720, which produced a third tract upon the subject by Mr. Martin, and there the controversy ended; nor, we believe, was it revived in a separate form, | until within these few years by Mr. archdeacon Travis and professor Person. Although Mr. Emlyn flattered himself that his doctrine gradually gained ground both in England and Ireland, he still continued to be so obnoxious, that none of the divines among the dissenters in London dared to ask him to preach for them, excepting the ministers of the baptist congregation at Barbican, Mr. Burroughs and Mr. (afterwards Dr.) James Foster, who invited him more than once to that office. About 1726, upon the decease of Mr. James Pierce, of Exeter, several of the people wished to invite Mr. Emlyn thither; but, as soon as he was acquainted with it, | be requested them to desist, thanking them for their respectful attention to him, and excusing his acceptance of an invitation, on account of his declining years, and the feebleness of his limbs. Though our author lived in private retirement, he was honoured with the esteem and friendship of divers persons of distinguishe4 learning and in eminent stations. 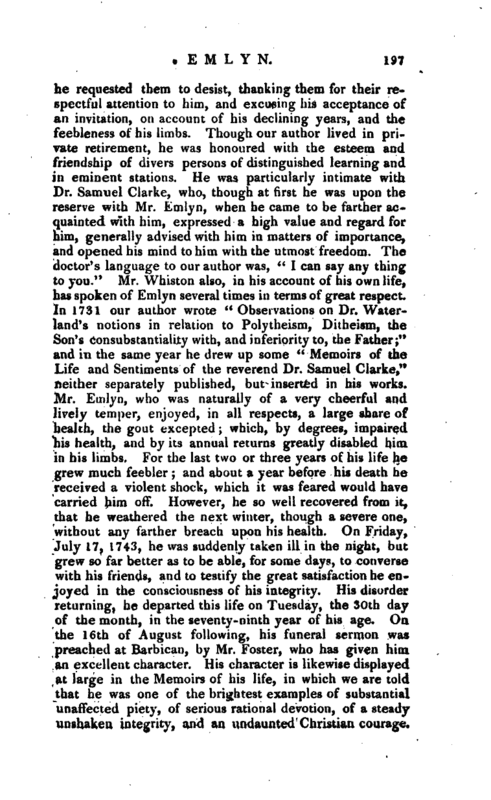 He was particularly intimate with Dr. Samuel Clarke, who, though at first he was upon the reserve with Mr. Emlyn, when he came to be farther acquainted with him, expressed a high value and regard for him, generally advised with him in matters of importance, and opened his mind to him with the utmost freedom. The doctor’s language to our author was, “I can say any thing to you.” Mr. Whiston also, in his account of his own life, has spoken of Emtyn several times in terms of great respect. In 1731 our author wrote “Observations on Dr. Waterland’s notions in relation to Polytheism, Ditheism, the Son’s consubstantiality with, and inferiority to, the Father;” and in the same year he drew up some “Memoirs of the Life and Sentiments of the reverend Dr. Samuel Clarke,” neither separately published, but inserted in his works. Mr. Einlyn, who was naturally of a very cheerful and lively temper, enjoyed, in all respects, a large share of health, the gout excepted; which, by degrees, impaired his health, and by its annual returns greatly disabled him in his limbs. For the last two or three years of his life he grew much feebler; and about a year before his death he received a violent shock, which it was feared would have carried him off. However, he so well recovered from it, that he weathered the next winter, though a severe one, without any farther breach upon his health. On Friday, July 17, 1743, he was suddenly taken ill in the night, but grew so far better as to be able, for some days, to converse with his friends, and to testify the great satisfaction he enjoyed in the consciousness of his integrity. His disorder returning, he departed this life on Tuesday, the 30th day of the month, in the seventy-ninth year of his age. On the 16th of August following, his funeral sermon was preached at Barbican, by Mr. Foster, who has given him an excellent character. His character is likewise displayed at large in the Memoirs of his life, in which we are told that he was one of the brightest examples of substantial unaffected piety, of serious rational devotion, of a steady unshaken integrity, and an undaunted Christian courage. | He was buried in Bunhill-Fields, where there is an inscription to his memory. The Memoirs of his life were written by his son, Sollom Emlyn, esq. and separately published in 1746. In the same year they were prefixed to a collection of his works, in two volumes, octavo. An appendix is added, containing several short papers, drawn up by our author, on various subjects. Mr. Sollom Emlyn, who was bred to the law, and became an eminent counsellor, was employed to publish lord chief justice Hale’s “History of the Pleas of the Crown,” which he did in 1736, in two volumes, folio, together with a preface and large notes, many, of which were contributed by Mr. William Whiston, a son of the celebrated Whiston, who also examined many of the records for the purpose of accuracy. Mr. Sollom Emlyn died in 1756, and left one son, Thomas Emlyn, esq. barrister at law, a bencher of Lincoln’s Inn, and fellow of the royal society, who died in 1797.